FinnSonic offers intelligent, safe and cost effective solutions for demanding parts cleaning needs. FinnSonic has served its well-known and successful customers worldwide for almost 40 years. When a component is immersed into the equipment tank an ultrasonic frequency vibration is transmitted into the liquid creating cavitation bubbles, and those cavitation bubbles are the ones that remove even the toughest impurities from the component surface. FinnSonic is recognized by its customers to provide intelligent, safe and cost effective cleaning and inspection solutions for demanding applications. 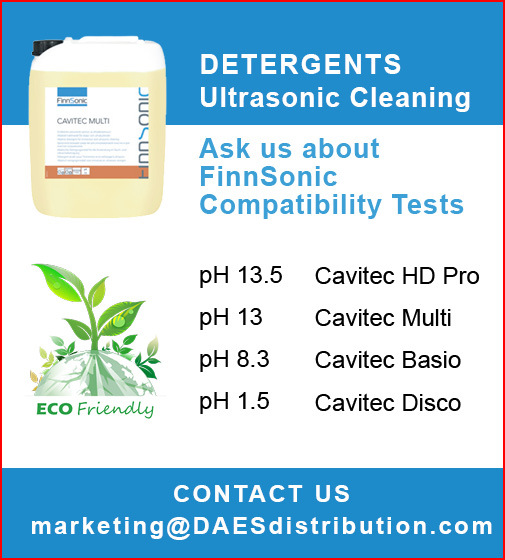 FinnSonic designs and supplies precision cleaning and FPI solutions for esteemed customers all over the world. FinnSonic is a GE licensed supplier for the cleaning and inspection equipment. With standard units capable to handle up to 1102 lbs, and the possibility to build bigger tailor made tanks to meet specific customer needs, FinnSonic Corus, is the perfect solution for components cleaning. Easy-to-use and environmentally friendly Corus leads you to improve efficiency: reducing labor cost, reducing cleaning time, and improving the cleaning results. FinnSonic Versa Genius cleaning line offers a wide range of setup possibilities and configurations that goes from a single manually operated unit to a fully automated multi-step process line. FinnSonic Optima offers intelligent, smart, safe and cost effective cleaning solutions for demanding applications. Ideal for cleaning jet engine parts, landing gear components, and airframe components. FinnSonic MI is a compact and fast solution for industrial parts cleaning. The unit is easy to operate, and maintain. MI series’ modules are made of stainless steel ideal for demanding conditions and heavy use. To obtain the best cleaning result, FinnSonic offers different options depending on the material to be cleaned, and the contaminant to be eliminated. FinnSonic - flexible and modular ultrasonic cleaning solutions and FPI Systems - will be exhibiting with us at the MRO Americas 2019.